Tom Cruise took it outside for the new Jack Reacher film, coming to cinemas on October 21st. 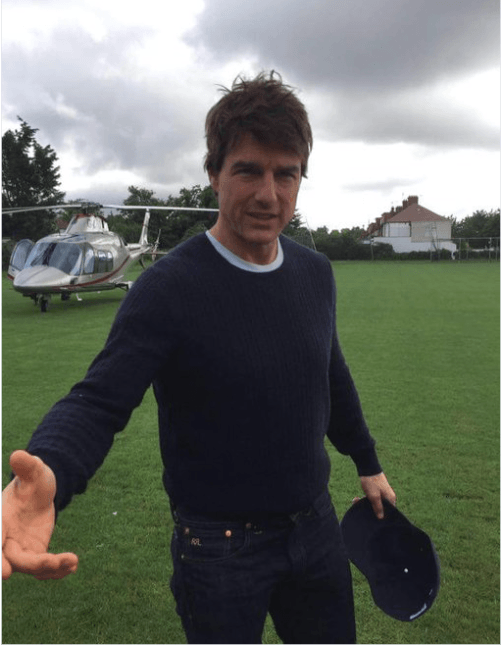 He was snapped arriving by helicoper at Old Rutlishians Cricket Club in Merton Park, in June, ahead of the filming. Although most of the London shoot took place inside Wimbledon studios, when Cruise needed to film on location, he called on Merton Film Office. FilmFixer manages the film office service for Merton Council. FilmFixer director Karen Everett says, “We’re not allowed to tell you much about the scenes filmed in Merton. Suffice to say, there’s a villain who’s surrounded, and an altercation follows. Make no mistake, though, this was a proper couple of days of Hollywood-style filming – right here in Merton. The shoot involved two truck mounted platforms, generators, and 100 cast and crew. Take a look at the trailer for Jack Reacher: Never Go Back. Cruise teams up with Cobie Smulders to uncover the truth behind a government conspiracy, pursued by the army, the FBI, Washington police, and four mysterious thugs.